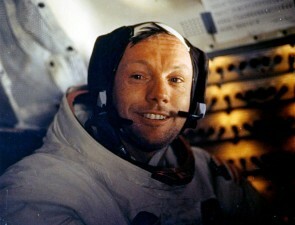 Neil Armstrong has passed away at the age of 82 yesterday. 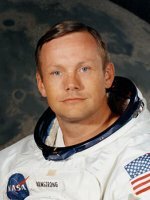 He'll never be forgotten as the first man to step on the moon during the American-Russian space race back in July 20, 1969, nor will his famous words "A small step for (a) man, a giant leap for mankind." I remember watching this entire Apollo 11 mission whenever I could as a kid, watching the final landing and moonwalk at my friend Timmy's house because his parents had a colour television, me and the other kids completely enthralled - there was no other news, nothing else to talk about. To say it inspired me is an understatement. To me all three of them are and always will be heroes - Buzz Aldrin, the second man on the moon, and Michael Collins who never made it to the moon, remaining in orbit in the command module awaiting their return. I can still visualize the lunar module heading down towards the moon's surface, very fast - for us it looked dangerous. Once they had landed, it was a long time before the walk occurred but we all waited patiently. Seeing that step - more of a jump, really, made us all whoop with joy. Difficult probably to explain how this moment captured the world's attention and imagination, raising everyone's spirits. I wonder if he had thought we would have gone further by now, as I did. It is well over forty years since that mission, and back then I thought by now we'd have stepped on Mars, too. I know we're all mired in an economic mess, and there are many nasty conflicts around the world, but a manned mission to Mars, especially an international one, would lift our collective spirits. I hope to see it in my day. 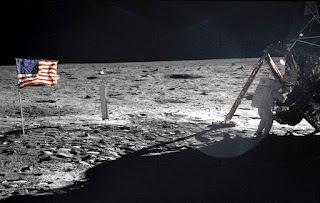 In the meantime, whenever I get stuck with my science fiction writing, I have only to stare at the moon, as I did back in 1969, in pure wonder that we have been there. Makes me proud of humanity.